When "Rock Band 4" was first announced, Harmonix promised that it was working on making as many of the old Xbox 360 drums, guitars, and microphones compatible with the new game as possible, but no details were given at the time. Fortunately, Harmonix has since revealed an extensive list of backward-compatible instruments that work with "Rock Band 4" on Xbox One. You can now rock out with your old instruments using the Xbox legacy game controller adapter. This information applies to all versions of the Xbox One, including the Xbox One S and Xbox One X. Because the Xbox 360 controllers use a proprietary wireless signal and the Xbox One uses Wi-Fi Direct for its controllers, using your old wireless Xbox 360 instruments on Xbox One requires an extra adapter. The legacy adapter for Xbox One is a small USB device that you plug into your Xbox One. It enables your console to receive signals from your wireless Xbox 360 drums and guitars. In contrast, the PlayStation 3 and PlayStation 4 both use Bluetooth, so no special adapter is needed to play older "Rock Band" instruments on the PS4. Only instruments from the same console family are backward compatible, so only PlayStation 3 (and some PS2) instruments work on PS4, and only Xbox 360 instruments work on Xbox One. 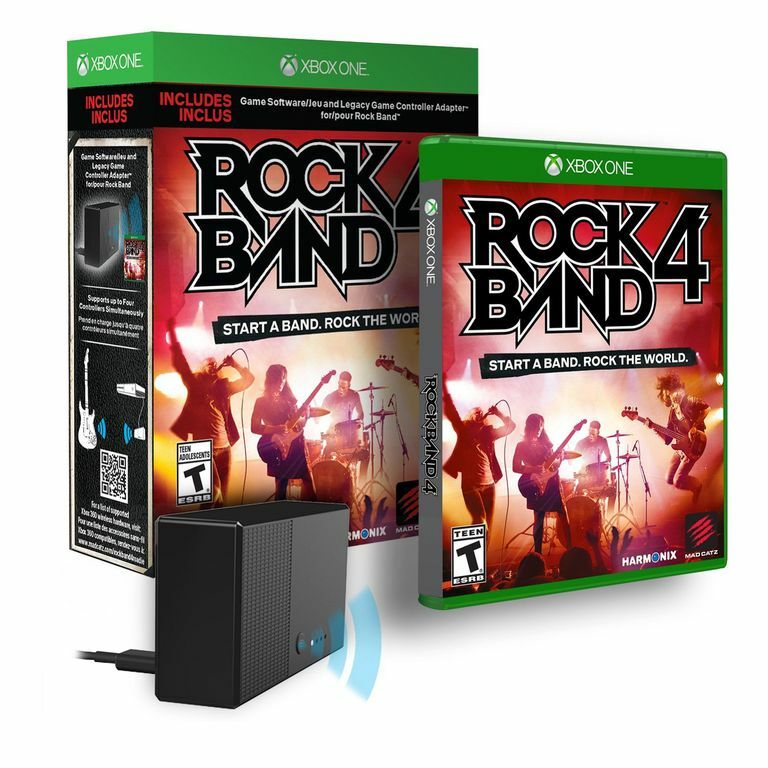 The legacy adapter comes bundled with some standalone versions of "Rock Band 4." Other hardware bundles that include the new Xbox One guitars, drums, and microphones do not come with the legacy adapter, but you can purchase one separately online for less than $20, as of late 2018. If you buy the digital version of "Rock Band 4" on Xbox One, you'll be given instructions on how to get the legacy adapter. It's possible to mix and match the new Xbox One instruments with your old Xbox 360 instruments while playing 'Rock Band 4.' You can connect up to four instruments at a time. Just about all of the wireless Xbox 360 instruments are compatible with "Rock Band 4" on Xbox One. Most wired instruments, like the original "Rock Band" drums and guitar or the "Guitar Hero 2" controller, are not compatible. Any wired USB microphone released with previous music games will work. You do not need the legacy adapter to sync microphones. So long as a controller is synced to your console, you can just plug in your microphone via the USB port. Turn on your Xbox One and start "Rock Band 4." Plug the legacy game controller adapter into the console. Hold down the Xbox 360 button on your instrument. It should be located in the center of your drum kit or next to the directional pad on your guitar. A green light around the Xbox 360 symbol should start blinking to indicate that the controller is waiting to sync. Simultaneously hold down the sync button on the legacy adapter and the small wireless button on your instrument. For "Rock Band" guitars, the button can be found where the amp plug would be. Hold down both buttons for about two seconds. The green light around the Xbox 360 symbol on your instrument should stop blinking, and a solid green light will appear in one of the four corners to indicate to which player the controller is assigned. Now you're ready to rock out.